Signing Your Customer up for Loyalty – How can we help? All new customers will have a message on their receipt inviting them to register their details for your Loyalty program. Each message will have a custom-URL, valid for one week. This will take the customer to a signup portal for your store, where they can fill in their details. Existing customers, you do have an email address for if you do not have email notifications turned on. To encourage customers to fill in their details, you can choose to offer a joining bonus or Bonus Loyalty for filling in the form. This can only be claimed once per customer. Tick the box to enable the bonus Loyalty reward. You can also choose to send your customers a welcome email inviting the customer to join your Loyalty program. The welcome email will also provide your customer with a link to your online portal. If you have chosen to provide Bonus Loyalty, these customers will also receive this. Existing customers whose email address you already have, when they make their first purchase after you enable Loyalty. 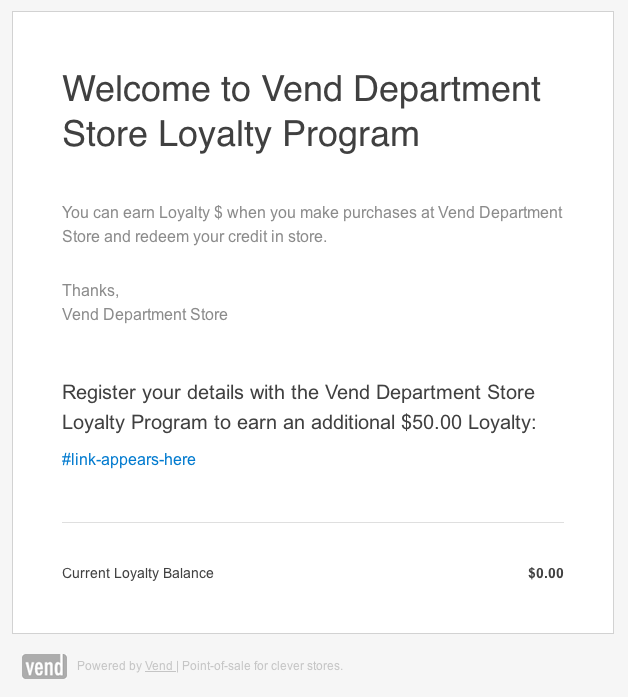 New customers added in the Vend sell screen at the time of purchase if you also add their email address and opt them into Loyalty. Click on the box next to Send welcome email to check it. Personalise the email content in the text edit box. You can preview your changes by clicking the Preview Email link. Finally, save your settings to turn your Loyalty program on.